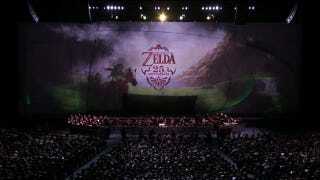 In case you've been waiting patiently for The Legend of Zelda Symphony Concert, good news! You'll only have to keep waiting until October...unless you're not in L.A.
Nintendo has announced via press release that the tour will kick off October 21st in Los Angeles, California at the Pantages Theatre. From there, it will go on hiatus until 2012. Tickets in L.A. will be $35, on sale August 1st at Ticketmaster. The concert will consist of a 70 piece orchestra, along with a choir. They will perform "new arrangemtents of a variety of songs" from across the Zelda series' 25 year history. Since the announcement of the concert tour at this year's E3, we have heard precious few details about the when and the where. This press release did not include details about dates for the 2012 leg of the tour, nor did it include other countries, cities, or regions that the tour will visit. We do know for certain that in addition to North America, the tour will hit Japan and Europe. "The Legend of Zelda has few peers in the pantheon of video game giants, and the games and their music have always shared a deep connection," Scott Moffitt, Nintendo of America's executive vice president of sales and marketing, says in a press release. "Through these concerts, fans nationwide will be able to gather and show their love for the quarter century of action, adventure and excitement that The Legend of Zelda games have brought to their lives."